The 2019 Subaru WRX STI is coming later this year but you might want to wait before you buy one. If you are thinking about buying a 2019 Subaru WRX STI, it likely won’t get much in the way of upgrades especially in the performance area. It's unusual to see Subaru making a lot of changes in the year right after a mid-cycle refresh (2018 MY), so we don't expect to see a lot of revisions to the 2019 WRX and STI. But big changes are coming if you can wait. When is the new-gen WRX/STI coming? Subaru’s has a five year “life-cycle”, for most of its models like the Forester, Outback, Crosstrek. Impreza and Legacy, but it may not apply to the performance WRX and WRX STI. Subaru undertakes redesigns less frequently for the STI, every six or seven years. The first-generation WRX lasted six years (2002 through 2007) and the second generation went seven years (2008 through 2014). Subaru introduced the current generation for 2015, and it received a mid-cycle refresh for 2018. The Japanese automaker is getting ready to give the WRX and WRX STI a complete overhaul, but Subaru has not announced when we will we see that model, perhaps as a 2020 or a 2021 model. The current generation model made it’s debut in 2015 with lots of changes from the previous generation model, and the new-generation will get even more changes when it arrives. The biggest change for the new-generation WRX/STI performance models will be the new Subaru Global Platform (SGP) they will ride on. 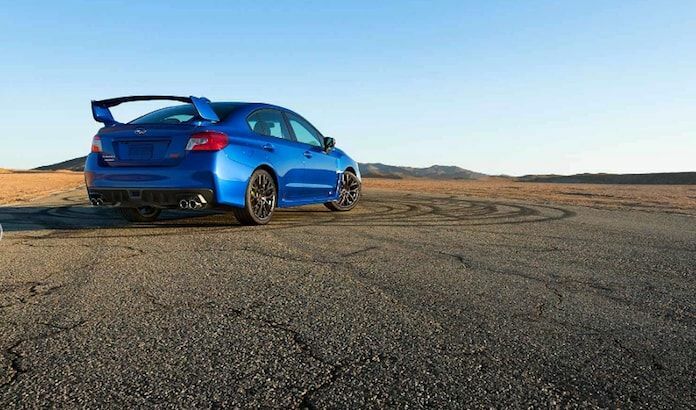 Performance enthusiasts will see noticeable changes in the WRX STI’s driving dynamics. In a nutshell, the new underpinnings will reduce vibrations and produce a smoother ride quality. The body and chassis will be 70-100 percent more rigid which will translate to improved steering response, and the increased rigidity of the suspension mounting could reduce body roll by 50 percent compared to current models. The new-generation WRX STI will also have a lower center of gravity improving driving dynamics in the corners producing a more dynamic ride. Subaru says the new global platform underpinning the 2017 Impreza and Crosstrek improves crash energy absorption by 40 percent over present models. Expect the same in the new-generation 2020-2021 Subaru WRX STI. Subaru WRX STI fans still want the aging EJ25 2.5-liter mill replaced with the new 2.0-liter direct injection FA20 power plant. And it could get a bump in power over the current 305hp on tap with the 2.5-liter boxer. Fans also want Subaru to bring back the hatch body style. Unfortunately, we don’t know what Subaru Corp plans to do, both are a possibility, but neither have been confirmed by Subaru. If you can’t wait two more years, the WRX/STI holds its value better than all other sports cars according to ALG. So if you buy a 2019 WRX STI, keep it two years, you won’t get dinged as much as other sports cars when you trade it in for a new-generation 2020-2021 STI. If you can wait, you’ll be able to get the all-new WRX STI with the new SGP, possibly a new power plant, more power and improved performance. Until then, the newly refreshed 2018-2019 sport-tuned Subaru WRX and performance-tuned WRX STI will continue to be popular with old and new fans alike. The sports cars are arguably still the best performance-car value around the globe. READ: Subaru WRX vs WRX STI; Which One Should You Buy? I do not like the fact that subaru uses a CVT transmission on their automatic WRX because you cannot modify it whatsoever. I hope they change to dual clutch like the Mitsubishi evolution. I SO hate CVT, in any form! Highly unlikely. With all the reports of failing dual clutch transmissions, reliability issues, and even BMW considering dropping it in favor of a single clutch 8 - 10 speed transmission, doubt this will ever happen. Plus, there's a reason why the Evo died, and Mitsubishi is hemorrhaging money. Automatic's aren't pointless. Not everyone's able to drive a manual. There are lot of people who are either handicapped or too old to drive a manual effectively and would still like to enjoy such a car. If you can drive a manual that's great, but people need to stop bashing people who are unable to and they should be able to have a wrx too, not just a typical econobox.